My lover is a used bookstore, and when I have money we play a game. He closes me inside him and won’t let me out till I find a certain book. And I do not know what it is or where it is, and so I have to touch every part of his insides to find it. And I wander him all over and touch his spines with my dry fingertips – slide the books from his worn-smooth wooden shelves and riffle his pages. I like the deckled edges best. Sometimes I will find an uncut page and when that happens I will turn my back so his clerk doesn’t see me and slit it with my pocketknife that I keep for only that purpose. That excites him, I think, more than most things I do, and often it means I have found my key. It is July 31, your birthday, and I can’t reach you. I’ve been trying all day, but the cell networks are down, the internet is down. I even tried a pay phone–there are two left in town that I know of, and I collected all of my change and walked to the 76 in the village. It was on fire. I watched it for a while from a distance as it painted a brown, toxic streak across the sky. It was a long walk back to the house, or what’s left of it. My feet hurt, and it was too quiet. Over the years, Tikka’s job as a Minor Propagandist for the planet Porcelain’s Bureau of Tourism had shaped her way of thinking. She dealt primarily in quintets of attractions, lists of five distributed by the Bureau: Five Major China Factories Where the Population of Porcelain Can Be Seen Being Created; Five Views of Porcelain’s Clay Fields; Five Restaurants Serving Native Cuisine at Its Most Natural. 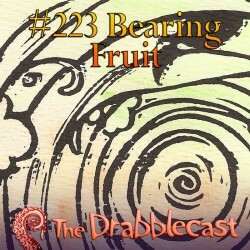 This episode of the Drabblecast is about adoption. In the drabble, a grieving father performs terrible experiments with the comfort food brought by well-intentioned neighbors. 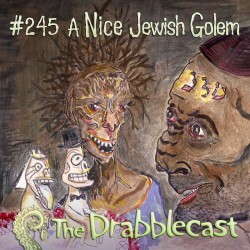 In the feature, a fawning mother grapples with conflicting fears for her son, a golem, when he falls in love with a non-Jewish construct. Despite her distress, she must ask: In a world where options for love are severely limited, what role does faith play? 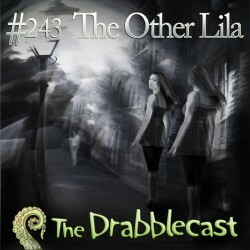 This episode of The Drabblecast explores the meaning of identity. In the drabble, two friends swap bodies after being struck by lightning, but is anyone paying attention? In the feature, having an extra finger after a teleporter accident turns out to be the least of Lila’s worries; she now must contend with an entirely additional Lila. 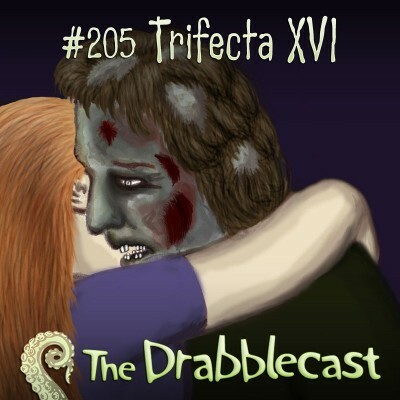 This episode of the Drabblecast is concerned with strange love. In the drabble, a mother’s last thoughts are for her son as the mower’s blades cut her down but pass over him. In the feature, Allan Thermoose’s wife falls in love with a blade of grass. Her behavior increasingly unconventional includes: standing outside staring at the lawn, forbidding Allan to cut that blade, sleeping outside on the lawn, and dressing up for the blade. It soon becomes clear that action must be taken. We do our job well! In a red tin-foil glove. 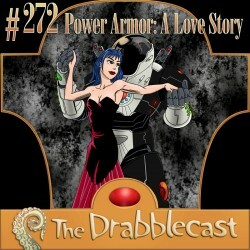 Romance is featured in this episode of the Drabblecast. 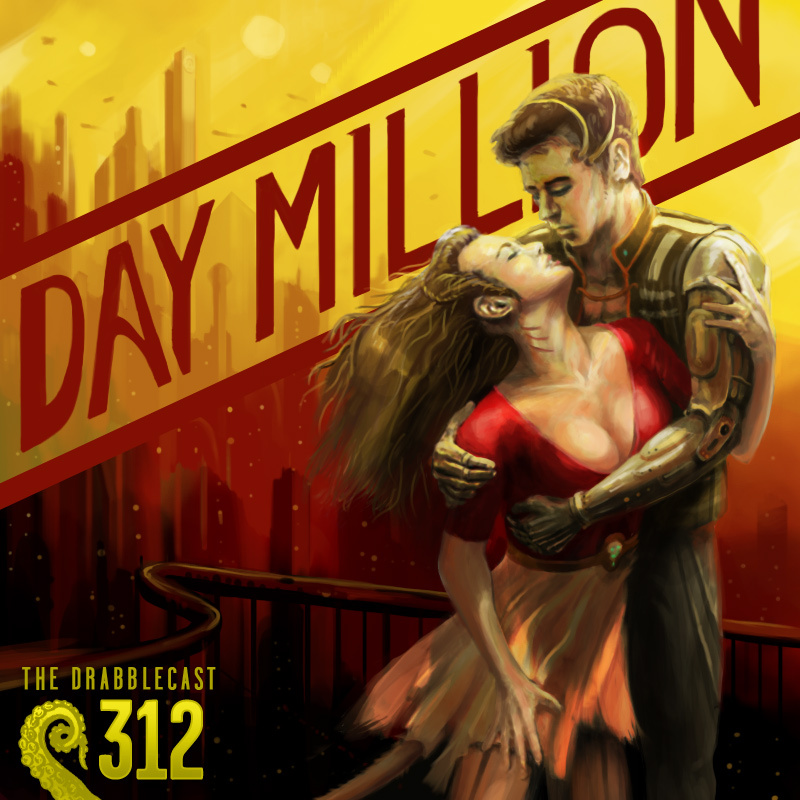 In the drabble, falling in love with a werewolf causes problems for a vampire. In the feature, on Valentine’s Day a freshly engaged couple stops at a tavern for dinner. They are seated among a collection of deities representing various traditions and religions who lead them to question their relationship, as well as the meaning of love and marriage at all among the horrors of the cosmos. This, of course, is what comes of being overly friendly with strange mangoes. One day you’re a wide-eyed virgin, with nary a care in the world; the next, you find yourself most unexpectedly and all but inexplicably burdened in a manner that afflicts virgins only once every two thousand years or so, to the best of your understanding. It isn’t fair, but folk tales rarely are to young maidens — this is the first thing that you really ought to have known. 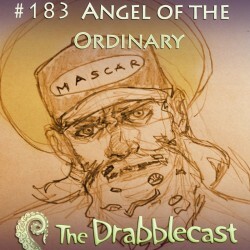 This week’s episode of the Drabblecast podcast begins with Norm imploring listeners to chip in for the production of his highly anticipated second CD. The Drabble is Déjà vu, by Ben Parker, concerns old magics and old memories. The feature is a change of pace story, Bearing Fruit by Nikki Alfar, in which a naive lass learns of life and her burgeoning womanhood upon unexpected contact with the supernatural. The show closes with classic bbardle Radioactive Runaways. Help support Norm’s New CD: The Esoteric Order of Sherman. Agree to contribute, guarantee yourself a copy – Pre-order the Order. Classic Norm Sherman penned and performed “bbardles,” done up proper with the full studio treatment, in a package featuring art work from man of mundane mystery Bo Kaier. 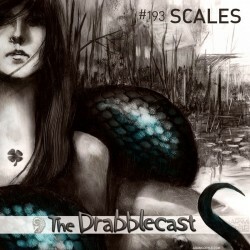 A Trifecta is comprised of three similarly themed stories selected by The Drabblecast’s editors. Now for some raucous scary fun! Love means never letting go. 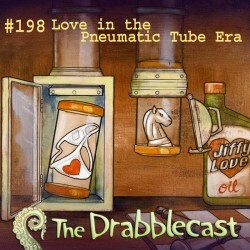 And biting..
We discover old scrolls that we wrote to each other in high school, back in the Early Pneumatic Tube Era. That was back when a PT message took five minutes to get across the city. 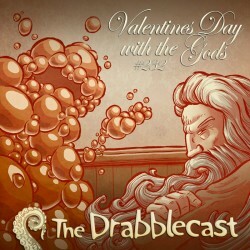 This Valentine’s Day episode of the Drabblecast’s theme is centered on odd love. Norm rattles off a staggering set of fart/love puns, and waxes on about the travails of staying together in the digital age. 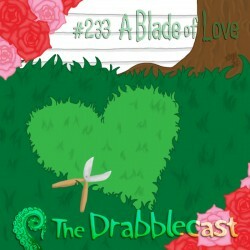 In the drabble, we experience love through a fighter’s eyes. 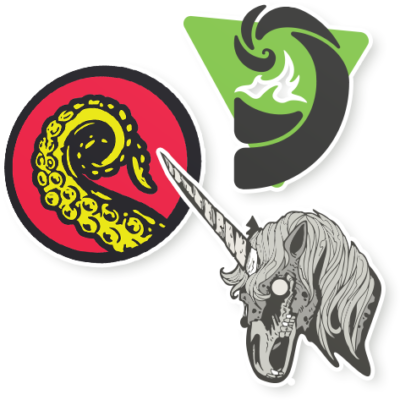 In the feature story, two soul mates seperated by great distance negotiate an alternate, steampunk (tube punk?) future. 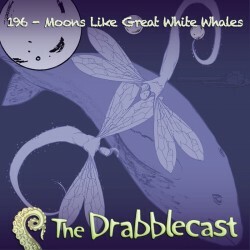 In addittion the Drabblecast 2010 People’s Choice nominations are announced. 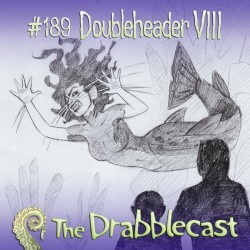 With the theme this week being about freedom, this episode of Drabblecast sees Norm musing about the irony of song about freedom written by a man name Key… it could be a trap. 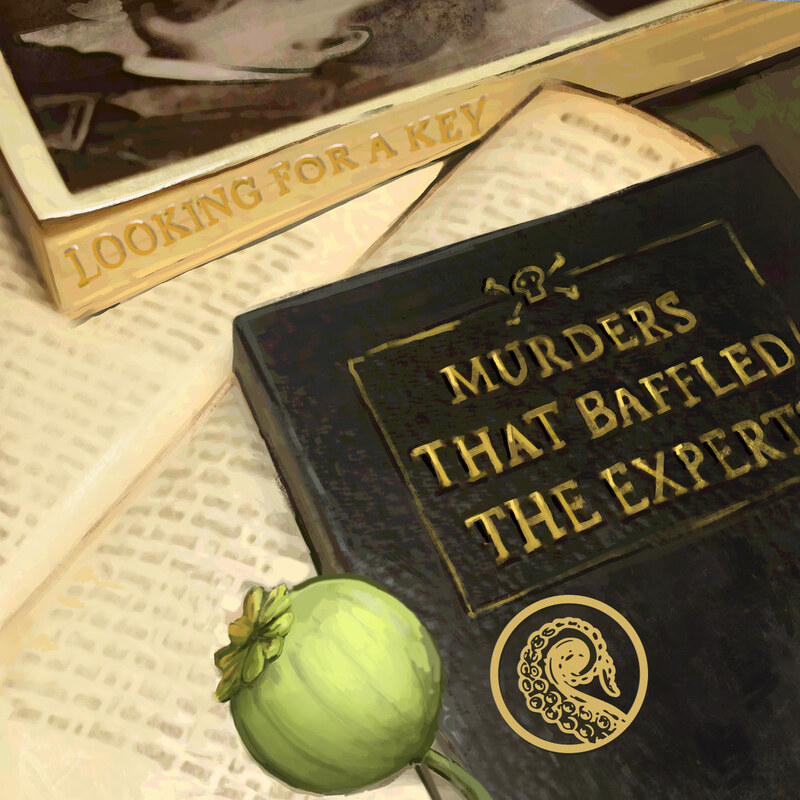 Mermaids of the Old West centers on the mistreatment of captured Mermaids. In Darkness we learn what makes a sacrifice worthy. Special thanks to Salim Fahdley and Jan Dennison for lending voices and artistic help. Norm presents this week’s Drabblecast in the form of a sermon, allowing us to bask in the glory of weird. The feature story, read by Hearty White, reveals unto us proper preparation for the coming Angels of Discrimination, scourges of the ordinary. Will you be ready?